Soft tissue injuries are incredibly common. All that it takes is one wrong move while playing a sport or participating in a physical activity of any kind, and you can incur a soft tissue injury. A fall, bump, or misguided twist can all lead to injury of your tendons, muscles, or ligaments, resulting in painful swelling. Acute soft tissue injuries involve muscles, tendons and ligaments and occur in an instant, causing sudden pain, disability and swelling. 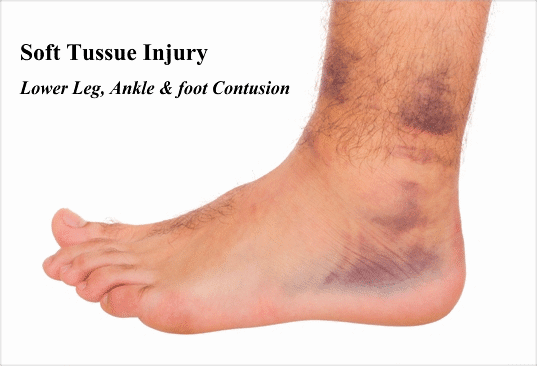 Examples are ankle sprains and torn muscles. Overuse soft tissue injuries on the other hand are characterised by a gradual increase in pain and disability and are caused by a gradual overload on tendons and ligaments. Examples are tendinitis, 'shin splints' and tennis elbow. Exercises and medication prescribed by your doctor are essential for treating soft tissue injuries. C) Sprains (tearing of a ligament or joint capsule). Your GP will give you advice on rest, medication and exercise. If there is tissue weakness the injury should be rested completely. This can be done by putting a splint on the injury which will limit your normal activities. Pain is usually a good indicator of whether you are exercising too much. Remember, while rest is important, some exercise will speed your recovery. You may need anti-inflammatory medication for a few days to provide some pain relief and to treat the tissue inflammation. Your GP will discuss your medication needs with you. Exercise will involve stretching and strengthening the injured site and your body in general. 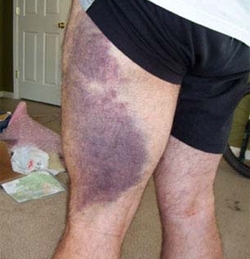 Overuse injuries are caused by doing too much of one activity - this may be too often, too hard or for too long. They can also be caused by doing the activity incorrectly. People vary in their ability to cope with repetitious activity and an overuse injury may represent an inbuilt 'weakness' placing that person at risk of repeated injury. An example is flat feet causing excessive foot twisting (or pronation) resulting in Achilles tendinitis or shin splints. Your GP will give you specific advice for managing overuse injuries. Stopping the activity causing the excessive loading of your tissues is vital. Anti-inflammatory treatment may involve medication (taken by mouth or applied to the skin), applying ice or heat to the injury, and/or physiotherapy. As there is a tissue weakness, stretching and strengthening exercises will be essential for a complete recovery. Examples and guidelines for these are below but your GP will probably give other more specific ones. Correcting an underlying cause may require referral to another doctor, podiatrist (as in the case of flat feet) or professional to have your technique analysed. Ask your GP if this is necessary. These exercises should involve the site of the injury as well as your entire body. 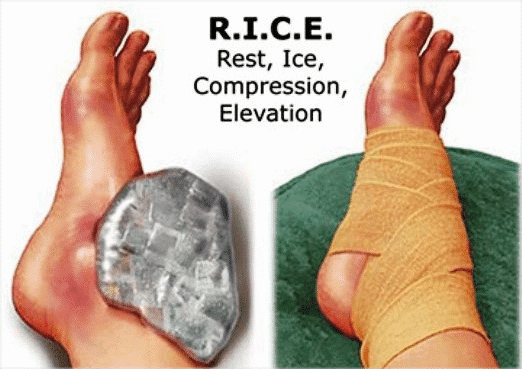 They restore length and some strength to the injured tissue and maintain full function of non-injured parts. Stretching exercises should be done slowly, without pain and without bouncing. Try to hold the stretches shown opposite for about 5-10 seconds and do five sets of them two or three times a day. Other specific stretching exercises will vary according to the injured site and will be given to you by your GP or physiotherapist. The strengthening exercises opposite involve a progressive increase in the resistance you apply and the number of times they are performed (repetitions). These exercises should be done gradually, regularly and usually under supervision. They are designed to strengthen the weakened tissue and maintain your general body strength. Try to do them in three or four sets of 10-30 repetitions every day. Becoming active again will depend on your injury, so make sure you follow your doctor's instructions. Generally, this will involve a progressive and gradual return to physical activity, sport and work. In the case of a lower limb injury, start with walking as early as possible, swimming, cycling and then jogging if appropriate. Do this three or four times a week for 25 to 40 minutes. With any injury, it's vital to maintain some level of fitness throughout your recovery with an exercise such as walking. Allow about 15 minutes to warm up and stretch. Following exercise, allow five minutes to cool down and stretch. Remember to slow down or stop if you are experiencing pain. • Calf stretch - place heels on the ground and balls of feet on a book, with legs straight. • Calf - rise up onto toes, hold for 2 seconds then down. With time, add speed, weight and then use each leg seperately. 1. How long have you had the injury? 2. Where exactly is the main seat of pain? 3. Can you relate the problem to a known injury you have had some time? 4. What is your job? 5. Do you do anything repetitively that makes it ache? 6. What have you tried so far and has anything helped? 1. Where is the pain coming from? 3. What can I do to get it better? 4. How long is it likely to last? 5. What can I do to stop it happening again?